This is another uninspiring Walkers bag design. 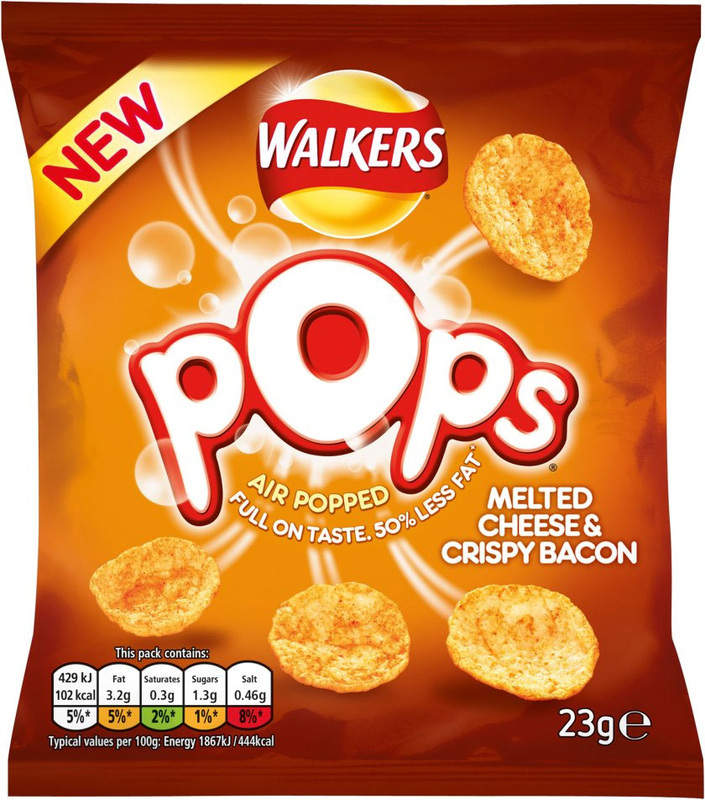 The ‘Pops’ is a great branding logo however, and the light and airy bubbles and seemingly flung away from the moniker Snacks, has the desired ‘popped’ effect. The bags are flavour colour coded. The flavour is in very small writing, almost as an after-thought. The bag also claims the snack is “Full on Taste. 50% Less Fat.” It does not however say what it is 50% less fat than. 0% Less content would have been a better, if admittedly less saleable claim. These Crisps featured a very well defined Crunch that did not deteriorate too quickly, nor turn to a soft polystyrene like many of their Popped style peers. The Air Popped nature of these Crisps saw what looked like a circular Crisp that had exploded from within. The boils were large. There was also orange seasoning on the pale yellow backgrounds. Before starting this review it should be pointed out that at just 19grams, this pack was around half the content weight of most traditional Crisps. It also featured just as high numbers, and in some cases higher, than many. There may have been just 84 calories, but double it in relation to weight and these would compare unfavourably with most other Walkers Crisps! And on to the review... A Nose Plunge Test revealed an aroma that you would associate with Bacon (Crisps style. Which is obviously nothing like real Bacon). The flavour however, although not striking in any way, did include a hint of Bacon and Cheese. Just a hint mind - certainly nothing to get excited about.